Photo: Petr PoliakThe caretaker of Karlštejn Castle doesn’t spend much time taking romantic rides or attending Lucullean feasts, as he must balance the needs of his crew and those of visitors, attending to various unusual situations. 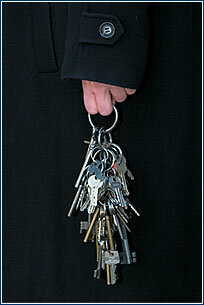 What are the duties of the caretaker of the most famous Czech medieval castle? I must ensure the proper operation and use of this landmark. Besides office work, I manage the employees, of whom there can be a hundred during the peak season. Additionally, we keep records on and take care of cultural furnishings and the building itself, and we arrange for repairs and renovations that are generally done with the facility in full operation. It’s demanding but gratifying work, and I love it passionately. How many employees do you have, and what are their positions? The number varies according to the season, ranging from twenty to one hundred. They include assistant caretaker, cleaners, maintenance workers, civil servants, guides, vendors of commercial goods, a dispatcher at the third gate, a secretary, and cashiers. Last year we hired 69 seasonal guides. How do you recruit new workers? What qualifications do you require? They ask us for jobs, mostly in letters or over the phone. They are usually students who want to work as guides as an opportunity to use foreign languages, or to make use of their knowledge of history. However, not everyone can do this work. We are a very busy historical landmark, and each year we have up to 300,000 visitors, which requires high quality communication. For this reason a job applicant must undergo tests on general history and languages. We also determine the communication skills of those applying for jobs as guides, whether the applicant is shy, and how good an organizer he or she is. After being selected, the guide must study the text to be presented to visitors. What do you do if a new guide doesn’t turn out to be competent for some reason or other? That does happen occasionally. For example, one guide didn’t know the text and refused to study it properly. She told visitors that Charles IV died of DNA, when instead he suffered from gout (ed note: the Czech word for gout is dna). To top it all off, she sovereignly claimed that the skull of a crocodile was the skull of a dragon that Charles IV killed. So you can see why we had to part ways. Do you handle employee misbehavior one-on-one, or do you do it at meetings, in front of others? Cases that can serve as examples or, conversely, as learning opportunities for others, are dealt with in groups, but I always ask the affected person what he or she thinks. I resolve problems with the quality of tour presentations or other, more personal matters one-on-one. Under what circumstances would you let an employee go? I’m not enthusiastic about firing people, and even though I sometimes have to do it, I always see it as the final resort for solving the problem. Fortunately, I have no reason to let permanent employees go. It’s different with seasonal employees with romantic ideas about their work and then discover that they have to work hard here. I believe that a person who makes a mistake must be punished for it, and that includes myself. We aren’t managing an ordinary building, we are running a major Czech public landmark, so we feel a sense of great responsibility. 1969 Age fifteen – starts as a guide at Kost Castle, alternating as a student between Sychrov Castle and Rožmberk nad Vltavou Castle. 1981 Becomes caretaker of the Český Šternberk historical landmark. 1982-86 Becomes the caretaker of Březnice Castle. 1985 Completes correspondence studies at the School of Economics. 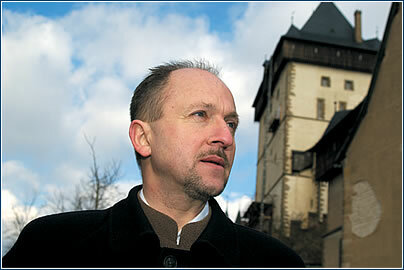 1986 Becomes the caretaker of Karlštejn Castle. It’s crucial. The entire team must be tight-knit. We even want some employees to be able to substitute for others, so that they can easily guide tourists, work at the third gate, or sell tickets in the box office. The cashier has to be able to communicate in four languages within five minutes with tourists who may be nervous or breathless from the climb. During the season your workers spend most of their time in an unusual – lovely but cloistered – environment, where they must adapt to each other. Does this cause any problems? How new seasonal employees fit in with the permanent staff is very important. We had one student here who couldn’t handle it. Everyone thought he was strange, too talkative, and conceited, and furthermore, he didn’t keep up with the pace of the work. The others demonstrated to him clearly that he wasn’t fitting in, so he finally left. I didn’t interfere in this conflict, because I didn’t think that was my job. How do you schedule work on the castle? Usually at Tuesday meetings, when we set the agenda for the week. Of course I can call extraordinary meetings as necessary. This happens when we receive an unplanned request, for example when we get a call from the chairman of the Estonian parliament, or when 70 NATO generals want to pay us a visit. We have to agree on who will serve as guides, because VIPs usually have special requests, and will want experienced guides. How do you think a good boss should behave? A good boss has to be able to combine the management of his people with the fulfillment of the tasks that his job requires of him. He should try to explain things well, because if he wants his employees to work well they have to know the reasons why. I personally am never against discussions. Equally important is the boss’ willingness to meet his subordinates half-way, to ensure their motivation. I try to follow these principles, even though I know I’m not an ideal boss. But it seems to me that the people here are satisfied, and they have respect for their work. Money definitely isn’t the way, as they don’t make much here. Seasonal guides earn CZK 30-40 per hour, and permanent staff members make CZK 6,000-8,000 before taxes. So instead I see the environment here as a motivational force, as well as a love of history, and, last but not least, the feeling of belonging to a team. Possibly some of my employees work here so they can say that they work at a castle, because it sounds so nice.